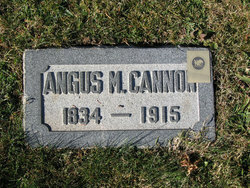 Angus M. Cannon was born 5/17/1834 in Liverpool, England. He and his family were baptized in the Mormon church on 2/11/1840. They left Liverpool by boat in September of 1842. His mother died at sea and his father died in 1844. He lived with his sister Mary Alice and her husband, Charles Lambert, in Nauvoo. He arrived in Salt Lake City in October of 1949. In November of 1850, we went with the George A. Smith company to settle Iron County in Southern Utah. They arrived at the present site of Parowan in January of 1851 and he was there until returning to Salt Lake in May of 1851. He served a mission in the eastern United States from 1854 to 1858 when he was called back as a result of the Utah War. In the summer of 1858, he married Ann Amanda Mousley and Sarah Maria Mousley who he had met while working in Delaware. Angus was the head of one of the 309 families called to settle St. George in 1861. He settled on the Rio Virgen and was part of the committee that located St. George. 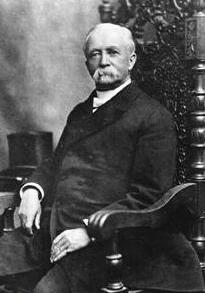 He was elected as the first mayor of St. George on 4/7/1862 and reelected for a second term in March of 1864. He was also the Washington County prosecuting attorney for four years. He was involved in various positions within the militia, 1865-1867. In 1867, he returned to Salt Lake City for health reasons. There he was the 7th President of the Salt Lake Stake (covering Davis, Morgan, Salt Lake, Summit, and Wasatch Counties) from April 1876 to 1905. He was convicted of polygamy and served six months in the Utah State Penitentiary in 1885. Angus was the Republican Party candidate in the 1896 "at large" election for state senator from Salt Lake County, but was defeated by his wife, Martha Maria Hughes Cannon, who ran as a Democrat. After being released as Stake President, he was called as the Stake Patriarch. Angus died on 6/17/1915 in Salt Lake City. His funeral was held in the Assembly Hall on Temple Square and he was buried in the Salt Lake City Cemetery, Plot C_5_14_1_E.